Bear with me for a second while I check to see if there’s any obvious outrageousness this morning that I need to comment on right away. [checks LAT, NYT, WSJ, WaPo] Nah, not really. So let’s talk science. You all know about Schrödinger’s cat, poor thing, don’t you? The basic idea behind the experiment is that in the quantum world of particles we don’t know if a particle changes state until we observe it. Before that, it’s in an indeterminate state doing nothing in particular. 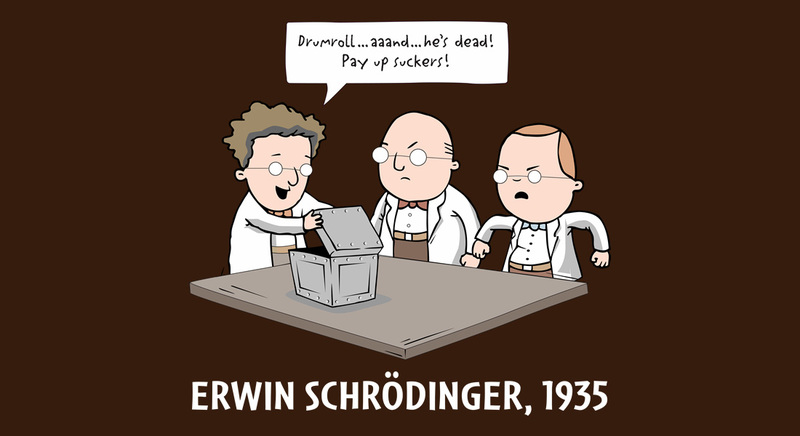 So Erwin Schrödinger proposed that we put a cat in a box along with a particle that has a 50 percent chance of turning radioactive and killing the cat. Eventually we open the box and find out what happened. But what about the cat before we open the box? It’s one thing to say that the particle is all smushed out and we don’t really know what state it’s in. But a cat? Come on. The cat is either dead or alive. But no: Schrödinger says that the cat too remains in a mysterious smeared out state, neither dead nor alive, until we open the box. At that point “the wave equation collapses” and the cat’s fate is determined. That sounds weird, but whatever. Not as weird as plenty of other stuff in quantum mechanics. The thing is that no one really, truly believes quantum mechanics. Even physicists. Oh, they’ll do the math and produce answers accurate to ten decimal points. And the math always produces correct answers. But the answers are weird, so there’s long been a cottage industry in trying to “break” quantum mechanics to figure out what’s really going on below all the weirdness. These attempts are often very clever (physicists, right?) but they always fail. In Alice’s box, she sends a particle to Bob that gives him a rough idea of whether the cat died. In Bob’s box, he measures the particle as either spin-up or spin-down, “which creates a complicated entangled state of Bob’s mental state, Alice’s mental state, and the state of the cat.” This is according to Chad Orzel, author of How to Teach Quantum Physics to Your Dog. Meanwhile, outside the boxes, Ted and Alice do their own measurements. In both cases, the measurements are weird and complicated, but basically Ted has a 50 chance of returning “OK” if Alice has detected a dead cat, while Carol has a 50 percent chance of returning OK if Bob has detected a spin-up particle. There are a bunch of things that I don’t really follow about this, though. For one thing, given that I can grind through the math to show that the cat lives one time in twelve, I’m not sure why this is supposed to be a surprise to any of our intrepid experimenters. It seems like reasoning about the results from quantum mechanics ought to lead them to the same conclusion– that the cat’s survival is unlikely but not impossible. It’s also not clear to me why everyone talking about this says that the experiment isn’t feasible because it requires Alice and Bob to be either humans or complex computers. Their role in this scheme seems pretty mechanical, so I’m not sure where the complexity is coming from. Yeah, I agree with both those things. The first one just means that, as usual, someone has made a subtle error in reasoning. Maybe when Alice sends the particle to Bob, the time it spends in between the boxes affects things somehow. Maybe measuring the cat’s pulse affects the state of Alice’s box. Who knows? But there’s always something. Meh. Someone made a mistake. Eventually someone else will figure it out. It’s quantum mechanics. It will never make sense to us meat machines. ¹Bob and Carol and Ted and Alice. Get it? Physicists are hilarious.